AIIMS Bhubaneswar Notification is out. 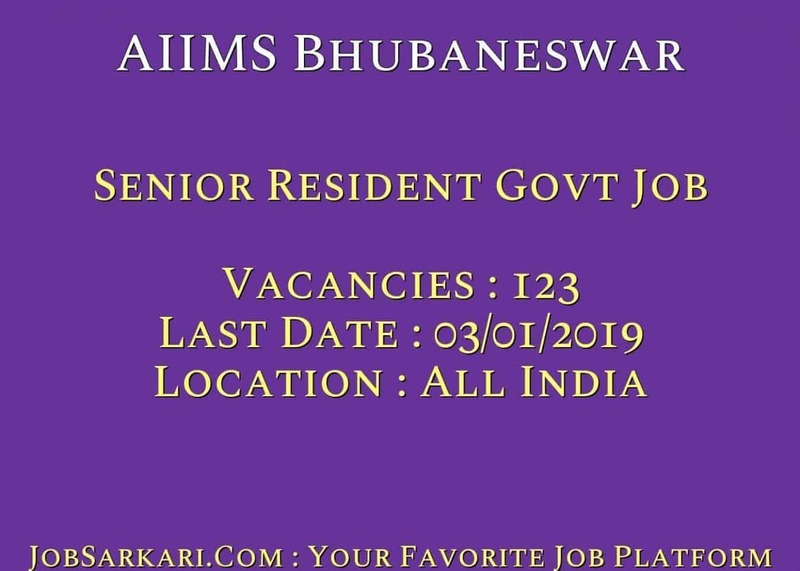 AIIMS Bhubaneswar is recruiting for 123 Senior Resident Govt Job Posts. You can check AIIMS Bhubaneswar - All India Institute of Medical Science last date, download AIIMS Bhubaneswar notification, visit AIIMS Bhubaneswar official website and check other AIIMS Bhubaneswar Vacancy details.Complete Vacancy and recruitment Details about 123 Senior Resident Govt Job vacancies in AIIMS Bhubaneswar are provided below by JobSarkari.Com only for you. Last Date for Apply Online 03/01/2019. Mode of Payment Application Fee Can be Submitted through Neft in the Following Account. Payable at Bank of India, AIIMS, Bhubaneswar Campus Branch, Odisha. Burns & Plastic Surgery 07. Forensic Medicine & Toxicology 01. Total No of Post 123. Candidate Must Have Passed Postgraduate Medical Degree / MD / MS / DM / M.Ch / DNB as Per MCI and Qualified Exam by 31/12/2018 and Tenure Should be Completing Latest by 31/01/2019. 3.Fill All the Mandatory Details in Application Form. 4.Upload the Scanned Copy of Documents in the Application Form in the Prescribed Size and Format. 5.Online Application Can be Submitted on or Before 03rd January 2019. Q. What is the Last Date For AIIMS Bhubaneswar Senior Resident Govt Job Vacancy ? A. 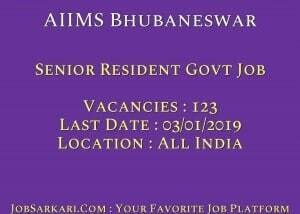 Last Date for AIIMS Bhubaneswar Senior Resident Govt Job Posts is 03/01/2019. Q. What is the Form Type of AIIMS Bhubaneswar Senior Resident Govt Job Recruitment ? A. The Form Type for AIIMS Bhubaneswar Senior Resident Govt Job Posts is Online. Q. How many vacancies are available in All India Institute of Medical Science Senior Resident Govt Job Posts ? A. There are about 100 Vacancies in All India Institute of Medical Science Senior Resident Govt Job Posts. Q. What is the Full Form of AIIMS Bhubaneswar ? A. Full Form of AIIMS Bhubaneswar is All India Institute of Medical Science .